The following contract has been written for the protection of the Puppy, the Buyer and the Breeder. To the Best of the Breeder's knowledge the puppy is in good health at the time of this sale, puppy was seen and had a routine health examination by a licensed veterinarian, puppy is up to date on dewormings. Buyer is to have the puppy examined by a state licensed vet within 72 hours of receiving puppy at which time puppy should receive first vaccines. Breeder has provided puppy with mental and sensory stimulation through various toys introduced daily and environmental surfaces, planned outings and using a Sensory Stimulation Activity Box, as well as Bio-Sensor stimulation to help ensure that your puppy is happy, calm, confident, socialized and well adjusted. In the event of a "proven" pre-existing life threatening medical conditon, or a "proven" genetic disorder that would prevent the puppy from fulfilling the intended purpose it was purchased for (show/breeding, etc) the Breeder guarantees the puppy from puppy's date of birth, for a total of 1 year (buyer has option to extend 1 year guarantee to 5 years if buyer provides NuVet Plus Supplement Wafers daily and feeds puppy a premium dog food, formula appropriate for age, daily for the first 3 years of life) Guarantee covers up to 2 years for severe hip dysplasia. This guarantee does not cover any common puppy ailments including but not limited to worms, coccidia and or giardia, vitamin deficiencies, ear infections, any viral, bacterial diseases, disorders brought on by parasites, the development of disqualifying faults, diseases, or disorders, which are due to the Buyer's negligence, chance, or environmental conditions such as missing or misaligned adult teeth, Vaccinosis, Cancer, Addisons, Digestive disorders, Bloat and Allergies. As of date of purchase the Buyer is responsible for any and all medical or legal costs for the puppy. Umbilical hernias are not a health issue, nor do they present any cause for concern. Buyer is responsible for and agrees to provide routine veterinary care for the puppy including age appropriate vaccinations, routine worm checks and puppy should be fed a premium dog food. Buyer will be asked to produce such records of care if Buyer has to return the puppy for replacement. This contract will be null and void if Buyer fails to provide routine veterinary care, if puppy is Bred (unless full registration has been given), Injured by accident or neglect or if any of the terms of this agreement are not followed. Breeder is to be notified immediately of any cause for concern of puppy. In the event that the puppy is to be returned to Breeder, Buyer shall and will be responsible for ALL transportaion costs back to Breeder as well as ALL transportation costs of replacement puppy to Buyer. If a replacement puppy is provided, Buyer will then sign a new contract. 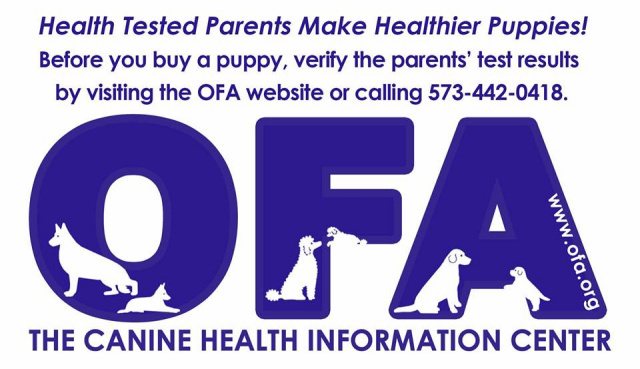 If this puppy is sold for breeding/showing purposes, puppy buyer agrees to perform health testing prior to breeding with results found to be negative of any diseases or defects, which would render the dog not breeding worthy. Puppies can be tested at 5 months of age for the purpose of preliminary OFA hip evaluation. Breeding worthy females will not be bred until they reach 18 months of age and breeding worthy males may be used for breeding after 1 year of age, either male or female breeding puppy must have good or better preliminary hip exam results. This puppy is nontransferable, in the event you can no longer keep your puppy/dog you are bound by this contract to contact me to make arrangements to return puppy to breeder at your expense. This puppy is not to be sold to third parties, this puppy is not to be surrendered to a shelter. This puppy is not sold on a trial basis and Breeder demands puppies return to Breeder if buyer is unable or unwilling to care for puppy. This puppy is sold on spay/neuter contract, puppy must be spayed/neutered by 12 month's of age. Breeder must receive from Buyer of puppy, copy of licensed vet bill, showing your pets name, date of birth, breed and microchip number, stating completion of spay/neuter. This must be received by 14 months of age at which time breeder will then mail puppies AKC limited registration paper's to Buyer. If Breeder does not receive spay/neuter certificate/vet bill, Breeder has the right to request return of puppy and no monies (purchase price) paid by Buyer, shall be refunded to Buyer. I, as the Buyer of the puppy listed below, have read Breeder's contract, I agree to and understand fully the contents contained in it and also acknowledge receipt of said contract. Nothing is implied that is not written in this contract. If the Buyer chooses to break any of the terms of this agreement, the contract will no longer be in effect and the guarantee for puppy will be null and void, resulting in immediate return of puppy to Breeder. By signing this agreement, you are agreeing to stipulations set forth herein. Upon reading this document and thereafter purchasing puppy/puppies, you are agreeing to stipulations contained herein.